I have an Edgewater 225cc with a 225 hp yamaha 4 stroke, T-Top with radar mount 6" plus dome and a stainless steel anchor pulpit. Can you send me a quote for a cover, No hurry. will work on everything today. Thank you for the opportunity. 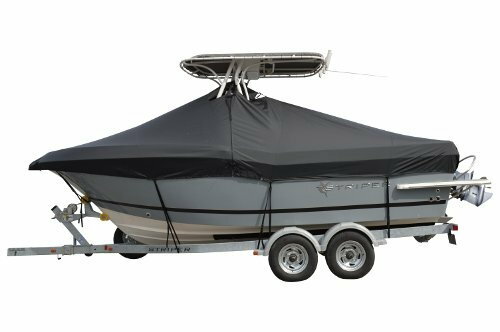 Hey, I'm looking for a console cover for 2017 Cobia 296 with a hardtop. Just something like t-top curtains that covers seat in front of console and helm seats really. Would love a quote. No rush, thanks! Looking for a cover for a 24' McKee Freedom. Hopefully the pics show up for you. Thank you. Yes, can see the picture. I will have all info and pricing over to you today. Need a cover for a 2007 Key West 225DC. Please send quote to davidm66@gmail.com. Just a warning to those of you who plan on trailering with your cover...make sure the fit isn't awful before your 30 day return policy. I failed to do that (my fault/responsibility). Here's how my cover looks that I was told fits my boat. I towed at 10mph and the cover broke where the strap attaches.. Sounds like it's going to get warrantied (I need to file a claim). If anyone wants a windstorm cheap, let me know, I'm going to unload this thing as soon as the warranty work is complete! I think you put it on backwards. Nope, the antenna only fits one way. Best thing is putting both of these on by myself takes less time and effort as the full cover ever did. Thanks Daren!! Can you make a cover for World Cat 290EC? Westland makes an awesome semi-custom, under the T-top cover. Get the protection of an under the top cover without the custom price tag. Call or email me and I will send you info and pricing. Can you PM me pricing and options for a cover for my 2550 Bluewater. I have a Ttop with radar and outriggers, but I dont care so much about covering that. Just want something affordable and something thats not too hard to put on after a long day of fishing!